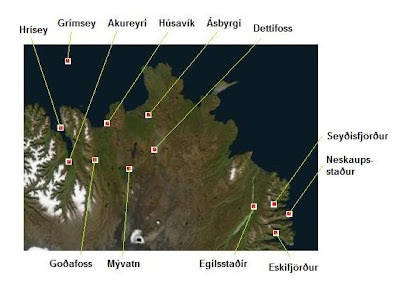 Here is a map of the North-East part of Iceland with the places described on the page marked by a red dot. Húsavík: 90 km - Ásbyrgi 160 km - Mývatn: 100 km - Egilsstaðir: 265 km. Sailing from Akureyri to Grímsey: 3 hours. Flying from Akureyri to Grímsey: 25 min. Flying from Reykjavík to Grímsey: 2 hours. Driving from Akureyri to Dalvík: 20 min. Sailing from Dalvík to Hrísey: 15 min. 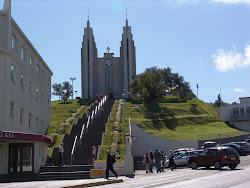 Akureyri is the biggest town of the northern Iceland and the biggest city after Reykjavik and its surroundings. Just outside Akureyri (heading east), there is a very nice spot called 'Kjarnaskógur Woods'. It is a big area where it is nice to walk around and play. The swimming-pool in Akureyri is one of the most famous one in Iceland. It is very well equiped, with many geothermal hot pots, a Turkish bath, waterslides, a children's pool as well as an indoor and outdoor pool. Close to the swimming pool there is a family garden with popular playground equipment. It is very nice walking around and seizing the atmosphere. You can sit down at a café in the 'pedestrian-street' downtown or count the stairs up to the church. It is also possible to have a guided tour around the town. Other activities might include bowling, horseback-riding or sea-angling. Akureyri has a good ski-area close to the town. Just drive up to the mountain above. It can also be fun going there during the summer, just to walk around. You get a bird eye view over Akureyri and surroundings. For more information, please check this web-page. From Akureyri there are scheduled tours to Húsavík, Mývatn, Ásbyrgi, Dettifoss and other places. As the road to Dettifoss is not very good I would recommend an organized trip if you are in a small car. Check for example this web-page. Hrísey is a small island in Eyjafjörður. 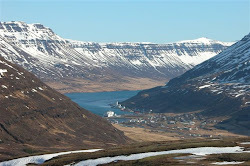 To get there, drive about 30 minutes from Akureyri to a town called 'Dalvík' and take a ferry there. The sailing takes about 15 minutes and it goes every hour or every other hour. There are almost no cars in Hrísey, an old 'tractor' to transport the luggage or goods if needed. It is incredible how relaxing a stay there can be. The town is very small, with one shop, a church and a small but very nice swimming-pool. You can join a round-trip with the 'tractor' or walk around. The birdlife is very rich and there are many marked walking paths. The shore is alse very nice, some small sandy beaches where kids like to run around. Grímsey is situated directly on the Arctic Circle, about 40 km north of Iceland. If you go there you get a certificate that you have been to the Arctic Circle. It is the northernmost inhabited region of Iceland, with a population of about 100 people. The main industry is fishery. The island is connected to the mainland by a ferry that sails to Dalvík and by plains to Akureyri and Reykjavik. 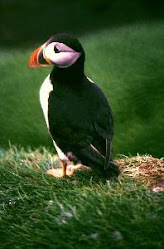 The birdlife in Grímsey is spectacular and the overall atmosphere is very friendly. There is a shop, cafés, guesthouse and of course a swimming-pool in the island. 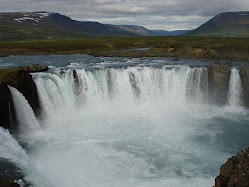 Midway between Akureyri and Mývatn you find a beautiful waterfall called Goðafoss (Goð = God). Into this waterfall, the old heathen gods were thrown, when the nation decided to convert to Christianity in the year 1000. Lake Mývatn was shaped by repeated volcanic eruptions. All around the lake you can see sculptures in the lava, craters and cave formations. In and around the lake there is rich bird- and fishlife. On the east part of the lake you find 'Dimmuborgir', a place with volcanic rock formations. The best known formation is "the Church", a cave open at both ends with a high dome-shaped roof. It is very nice walking (or running) around there. A bit further, on your way to the East of the country you pass the Myvatn Nature Baths. They are a 'must' when you are travelling in this area. They are the 'Blue Lagoon' of the north, enjoyable to both adults and children with some hot springs all around you. Still further east there is Námaskarð, Leirhnjúkur and Krafla. 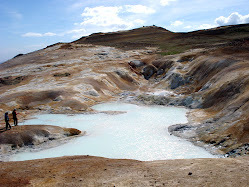 Námaskarð is a very colorful spot, with boiling mud-bogs and so called solfatoras. The mineral deposits create a variety of colors: blue for pyrite and yellow for sulfur. Please be careful there, especially with children, and follow the paths. The water is extremely hot (boiling). Krafla, the geothermal powerplant, is close by. Other places not to be missed include Hverfjall (mountain), Grjótagjá (small cave with thermal spring inside; before it was possible to bathe there but the water is too warm now (50°C)), Höfdi (a peninsula into the lake with panoramic view of the whole Lake Myvatn area) and Lofthellir (a cave). Around 450 people live in the district of Skútustadahreppur with around 200 in the village of Reykjahlid. Husavik is a small town by the sea with about 2500 inhabitants, about 90 km from Akureyri. It is sometimes called: “The Whale Spotting Capital of The World” as it was the first place in Iceland to offer whale watching cruises. It has also a Whale Museum which is ideal for getting better acquainted with the giants of the oceans. It also has a very nice Folks Museum and easy atmosphere so it is nice just walking around. Jökulsárgljúfur National Park was established in 1973. 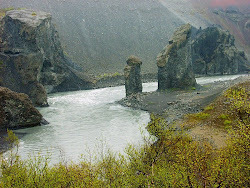 Its area covers 150 km² and a 35 km long stretch along the western side of the glacial river Jokulsa. The river canyons are about 25 km long and resemble the Grand Canyons in Arizona, USA. Places of interest include the Asbyrgi Canyon, The Whispering Cliffs (Hljóðaklettar) and the grand Dettifoss waterfall. The park is ideal for short or long hikes. There is no better way to enjoy its charm fully. The Ásbygi-canyon are horseshoeshaped with vertical cliffs up to 100 metres high surrounding it. The legend says that the horse of Óðinn, the chief god of Norse mythology, kicked with his hoof into the ground which resulted in Ásbyrgi-canyon. A big rock, "The Island" is rising in its centre and a small lake is in its inner end. This is a place kids love. Up along the glacier-river 'Jökulsá' you pass the Whispering Cliffs, Holmatungur and Dettifoss. See map. The Whispering Cliffs are about 30 minutes drive from Ásbyrgi. The crater-cliffs have a strange formation, you can see whatever your imagination can think of, in them. 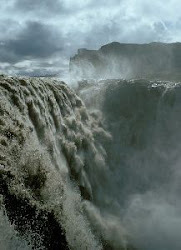 Dettifoss is rated as Europe's most powerful waterfall, based on its magnitude. You can feel the ground tremble when you walk close to it. It is 45 m high and about 100 m wide. Dettifoss is in a series of waterfalls in the glacial river Jökulsá á Fjöllum, which emerges from beneath Vatnajökull glacier and runs into Öxarfjörður bay. It is possible to reach the waterfalls from both sides of the river. Be careful when walking there as the area is rugged and the stones can also be slippery close to the waterfall. The roads to the waterfall are not very good so it is better to be in a 4 wheel drive car. Egilsstadir is the main town in the Eastern part of Iceland with about 2300 inhabitants. The town has an airport, college, hospital and of course a swimming pool. Lately there has been much growth in Egilsstadir and nearby towns because of the Kárahnjúkar Hydropower Project and Alcoa's aluminum smelting plant in Reyðarfjörður. Egilsstaðir stands by a river called 'Lögurinn'. It is very nice driving to Hallormstaðaskógur, one of the biggest 'forrests' in Iceland where you can also find a tree exhibition. Stop for example at 'Atlavik' by the river, which extends itself and is a lake there. 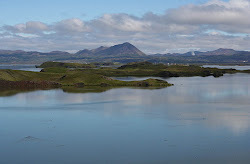 It is believed that the lake is inhabited by the famous serpent monster called 'Lagarfljótsormurinn', whose back is sometimes sighted rising over the waves. The 'East-fjords' is the name of all the fjords in the eastern part of the country. The mountains are rather steep there and the road follows the shore much of the time. There are many small towns on the way worth visiting. You can go down to the harbour and there you might see some kids fishing or just playing around. If you have equipment you can try fishing too as you don't need any permissions. Seyðisfjörður is one of these towns, about 30 km from Egilsstadir. The car ferry 'MV Norröna' of Smyril Line comes to Seyðisfjörður from Hanstholm in Denmark and Tórshavn in the Faroe Islands every week. It also calls at Bergen, Norway and Scrabster, Scotland. Other small towns are for example Reyðarfjörður, Eskifjörður and Neskaupsstaður.